The United States Merchant Marine Academy (also known as USMMA or Kings Point), one of the five United States service academies, is located in Kings Point, New York. It is charged with training officers for the United States Merchant Marine, branches of the military, and the transportation industry. Midshipmen (as students at the academy are called) are trained in marine engineering, navigation, ship's administration, maritime law, personnel management, international law, customs, and many other subjects important to the task of running a large ship. ✪ Top 6 Questions Merchant Marine | How much $$ do I make per month? Between 1874 and 1936, diverse federal legislation supported maritime training through school ships, internships at sea, and other methods. A disastrous fire in 1934 aboard the passenger ship SS Morro Castle, in which 134 lives were lost, convinced the U.S. Congress that direct federal involvement in efficient and standardized training was needed. Originally—and in cooperation with the State of New York (which donated the land)—the U.S. government planned to establish a large-scale Merchant Marine Academy at Fort Schuyler, New York; nothing came of these plans. Congress passed the landmark Merchant Marine Act in 1936, and two years later, the U.S. Merchant Marine Cadet Corps was established. In that year, the USTS Nantucket (ex-USS Ranger) was transferred from the Massachusetts Maritime Academy to Kings Point and renamed the USTS Emory Rice. The first training was given at temporary facilities until the academy's permanent site in Kings Point, New York was acquired in early 1942. 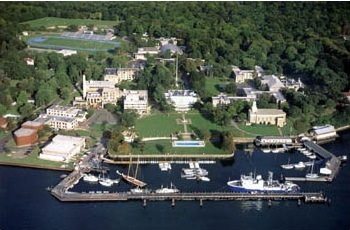 The Kings Point campus was originally Walter Chrysler's twelve-acre waterfront estate, named "Forker House" (now known as the USMMA's Wiley Hall). Construction of the academy began immediately, and 15 months later the task was virtually completed. The academy was dedicated on 30 September 1943, by President Franklin D. Roosevelt, who noted "the Academy serves the Merchant Marine as West Point serves the Army and Annapolis the Navy." World War II required the academy to forgo its normal operation and to devote all of its resources toward meeting the emergency need for Merchant Marine officers. Its enrollment rose to 2,700 men, and the planned course of instruction was reduced in length from four years to 18 months. To meet the wartime needs for qualified merchant marine officers two additional merchant marine cadet training school sites were established, one located in Pass Christian, Mississippi, and the other in San Mateo, California. (The San Mateo location was closed in September 1947, and the students transferred to Kings Point. The location in Pass Christian was similarly closed in 1950.) In spite of the war, shipboard training continued to be an integral part of the academy curriculum, and midshipmen served at sea in combat zones the world over. One hundred and forty-two midshipmen gave their lives in service to their country, and many others survived torpedo and aerial attacks. From 1942 to 1945, the academy graduated 6,895 officers. As the war drew to a close, plans were made to convert the academy's wartime curriculum to a four-year, college-level program to meet the peacetime requirements of the merchant marine. In 1948, such a course was instituted. Authorization for awarding the degree of bachelor of science to graduates was granted by Congress in 1949. The academy became fully accredited as a degree-granting institution in the same year. It was made a permanent institution by an Act of Congress in 1956. The academy accelerated graduating classes during the Korean War and the Vietnam War. It was involved in such programs as training U.S. officers for the nuclear-powered merchant ship, the NS Savannah. Admission requirements were amended in 1974, and this Academy became the first federal service academy to enroll female students, two years before the Military, Naval, Air Force, and Coast Guard Academies. During the Persian Gulf War in early 1991, and for many months prior to the war, both Academy graduates and midshipmen played important roles in the large sealift of military supplies to the Middle East. Midshipmen training at sea also participated in the humanitarian sealift to Somalia during Operation Restore Hope. In 1992, the academy acquired its largest campus-based training vessel, the T/V Kings Pointer. After 20 years at the academy, MARAD transferred the ship to the Texas Maritime Academy in Galveston to serve as its new primary training vessel. This was followed by an announcement on 21 August 2012, that the National Aeronautics and Space Administration (NASA) agreed to transfer the MV Liberty Star to the U.S. Department of Transportation for use as the new training vessel at the academy. Before being redesigned to serve as a training vessel for students, the former MV Liberty Star served as a solid rocket booster recovery vessel for NASA retrieving solid rocket boosters following space shuttle launches. In June 2014, the vessel was rechristened the T/V Kings Pointer, the fifth vessel of the academy to carry that name. The rechristening followed the earlier dedication of the academy's newly replaced Mallory Pier. In the 1990s, the academy's future came into question when it was included in the National Performance Review, chaired by Vice President Albert Gore, Jr. The report recommended halving the federal subsidy and requiring students to pay half of tuition to reduce costs. Congress, however, soundly rejected the recommendation and voted to continue the prohibitions on charging tuition to students. Between 2009 and 2014, the Obama Administration invested more than $450 million at the academy, including almost $100 million for capital improvements—the most funding ever secured for physical improvements at the academy. During the attacks of 11 September 2001, the Merchant Marine Academy assisted in the evacuation of civilians from Lower Manhattan as well as the transportation of first responders and supplies to and from Ground Zero. Midshipman, faculty, and staff from the academy, within hours of the attack, were using boats from the waterfront and sending them to the city. Members of the Merchant Marine Academy participated in the relief efforts for nine days. Merchant Marine Academy midshipmen and graduates have been involved in many facets of the war in Iraq. Many graduates were involved in the transportation of supplies during the buildup to the war in 2003. Many graduates in the U.S. Naval Reserve, now known as the Navy Reserve, have been called to active duty to serve supporting naval roles in ports in Iraq and Kuwait. Graduates who have entered other branches of the service have had more direct roles in Iraq. Aaron Seesan, a 2003 graduate and army first lieutenant, was the first graduate to give his life for his country during a war since the Vietnam War. George W. Bush delivering the commencement address at the academy. On 19 June 2006, President George W. Bush gave the commencement address at the academy, becoming the first sitting president to visit the academy. Be at least 17 years of age and must not have passed his or her 25th birthday before July 1 in the year of entrance. Be a citizen of the United States either by birth or naturalization, except for a limited number of international midshipmen specially authorized by Congress. Meet the physical, security and character requirements necessary for appointment as midshipman in the U.S. Naval Reserve. Obtain a Congressional nomination to the academy from a member of Congress. Medical/Physical Clearance – Candidates are required to pass a DoDMERB (Department of Defense Medical Examination Review Board) physical, and take the Candidate Fitness Assessment (CFA) to assess physical fitness. Security Clearance – In order to receive a commission at graduation as an officer in the U.S. Armed Forces, candidates are required to complete a security clearance upon enrollment at the academy. The academy is administered by the U.S. Maritime Administration, and has an annual budget of $121 million from the United States Department of Transportation. The entire student body is referred to as the Regiment of Midshipmen and is subdivided into three battalions and six companies (as of 2017). The 1st and 2nd Companies form the 1st Battalion, the 3rd and Band Companies make up the 2nd Battalion, while the 4th and 5th Company make the 3rd Battalion. Company assignment is random, although candidates with experience of playing a musical instrument are highly considered for joining the Band Company. The USMMA Department of Public Safety is a full-service law enforcement agency responsible for campus safety and security. It has mutual-aid agreements with the nearby Kings Point police and fire departments, and Nassau County Police Department, as well as investigative support from the Federal Bureau of Investigation. The Department Head is assisted by two federal police officers and two federal guards, with contract security guards utilized to meet minimum manning requirements. Federal police officers, federal guards, and contract guards wear distinct uniforms and perform access control, foot and motor patrols, respond to transmitted fire and security alarms, address safety and security matters, direct traffic, and enforce parking and traffic regulations. The police officers have full arrest authority under federal law (Title 40 United States Code Section 1315), and may also issue Federal and New York State summonses, protect persons and property, prevent breaches of the peace, and enforce rules and regulations for the protection of property at the academy. The guards have no arrest authority other than that of an ordinary citizen. Admitted appointees enter as "plebe candidates" in early July, and begin a two-and-a-half-week indoctrination period, or "indoc", run by upperclass instructors and supervised by United States Maritime Service officers of the Commandant of Midshipman's staff. It is a high-stress, intensive introduction to regimental life at the academy including physical training, history, customs and courtesies, and drill and ceremony. After indoc, the academic year begins with Acceptance Day in August, when plebe candidates are sworn into the U.S. Navy Reserve and join the Regiment as plebes. As plebes they are subject to stringent rules that govern daily life until the following spring, when they are recognized as midshipmen, fourth class, with eased restrictions and some privileges. Midshipmen focus on one of two ship transport areas of education: marine transportation or marine engineering. Marine transportation students learn about ship navigation, cargo handling, navigation rules and maritime law. Marine engineering students learn about the function of the ship's engines and its supporting systems. The two "Deck Majors" are: Marine Transportation and Maritime Logistics and Security. These majors grant midshipman a Third Mate license for work on steam or motor vessels of unlimited tonnage. The three "Engine Majors" are: Marine Engineering, Marine Engineering Systems, and Marine Engineering and Shipyard Management. These majors lead to the issuance of Third Assistant Engineer (3 A/E – Engineering Officer) licenses for steam and motor vessel of any horsepower. Marine Engineering Systems, and Marine Engineering and Shipyard Management, graduates are also qualified to sit for the Engineer in Training (EIT) examination administered by the National Council of Examiners for Engineering and Surveying (NCEES). For portions of their sophomore (third-class) and junior (second-class) years, midshipmen serve as cadets on US merchant ships. Midshipmen are typically assigned as pairs to a ship, an engineering cadet and a deck cadet, and operate as part of the crew, gaining hands-on experience as well as the opportunity to travel abroad to foreign ports; the average midshipman travels to eighteen countries during the three-hundred-day training period. This practical training results in an extended academic year that runs from late July to mid-June. Toward the end of 1st class (senior) year, midshipmen prepare for U.S. Coast Guard exams for a mandatory license as Third Assistant Engineer (steam and motor unlimited HP) or Third Mate (any gross tons, oceans). The USMMA Mariners compete in Division III of the NCAA, as a member of the Skyline Conference in all sports (men's sports include baseball, basketball, cross country, lacrosse, soccer, swimming & diving, tennis, and track & field; women's sports include basketball, cross country, lacrosse, swimming & diving, track & field, and volleyball) except in football, where they are an associate member of the Liberty League, and collegiate wrestling, where they are a member of the Centennial Conference. The USMMA was a member of the Skyline Conference until the 2006–07 season; the USMMA returned to the Skyline Conference for the 2016–17 academic year. The academy was also a charter member in the Landmark Conference from 2007 until 2016. The Merchant Marine Distinguished Service Medal is the highest award which can be bestowed upon members of the United States Merchant Marine and is the service’s equivalent of the Medal of Honor. Since mariners serving in the U.S. Merchant Marine are not directly employed by the Department of Defense, they are not eligible for the Medal of Honor. Since USMMA opened in 1943, eight midshipmen have been awarded the Distinguished Service Medal. Midshipmen at Kings Point have a wide variety of options upon graduation. Unlike the nation's other Federal Service Academies, graduates of USMMA are required to fulfill their service obligation on their own by providing annual proof of employment in a wide variety of occupations as approved by MARAD for a specified period of time. Graduates may elect to fulfill their service obligation by working as licensed officers on US-flagged merchant vessels, as civilians in the maritime industry, or as active duty officers in any branch of the uniformed services of the United States, including the Army, Navy, Marine Corps, Air Force, Coast Guard, Public Health Service, or the National Oceanic Atmospheric Administration. Regardless, graduates are required to maintain their US Coast Guard-issued merchant marine officer's license for a period of at least 6 years. Those graduates electing to enter the civilian work force in the maritime industry, and those sailing in the Merchant Marine, are also required to maintain their Navy Reserve commission (or another reserve component commission in the Army National Guard or Reserve, Marine Corps Reserve, Air Force National Guard or Reserve, or Coast Guard Reserve) for a period of at least 8 years after their commissioning as officers, and are required to serve in the maritime industry for at least 5 years following graduation. 3: A Commission as an Ensign in the U.S. Navy Reserve Strategic Sealift Officer Program (see: Navy Reserve Merchant Marine Insignia), or if accepted, as an Ensign in the US Navy, US Coast Guard (USCG), or National Oceanic and Atmospheric Administration (NOAA), or as a 2nd Lieutenant in the US Marine Corps, US Army, or US Air Force. Graduates who choose military service must serve at least five years in the active duty force of their respective service. The National Maritime Hall of Fame (the only permanent exhibit of its kind in the nation), which honors people and ships important to American oceanic, coastal, inland waterways, and Great Lakes shipping. Inductees into the Hall of Fame must be deceased, or sunk or scrapped, for at least five years. Only one person and one ship are inducted into the Hall of Fame each year. The Hall inducted its first set of members in or about 1982. Among the museum's many items are the world's largest collection of navigation and nautical instruments, and the only extensive selection of ship's china, on display anywhere in the world. In addition, one of the five surrender swords presented by the Japanese to General of the Army Douglas MacArthur at the conclusion of World War II is housed there. Images from the museum and from the academy can be seen at the Photographic Catalog of the US Merchant Marine Academy website. Above right is the academy photograph of Rear Admiral Richard Robert McNulty. As commodore of the U.S. Merchant Marine Cadet Corps of the U.S. Maritime Commission from 1938–1948 and for decades prior, he advocated for creation of the academy. The USMMA community considers McNulty to be the academy's "father". He was the academy's third superintendent. The letter appearing right is from the academy's early history and accompanied the photograph. The letter from the United States Merchant Marine Academy explains how, as the academy's third superintendent, Rear Admiral McNulty, strongly supported cadet sports, especially, baseball. the chairman of the USMMA Academic Advisory Board; and—the member of the House of Representatives for the congressional district in which the academy is located, as a nonvoting member—Chairmanship is rotated on a biannual basis between a member of the House of Representatives and a member of the Senate. The board is required to meet at least quarterly, in accordance with their Charter, including at least 1 meeting held at the academy on a date selected by the board in consultation with the Secretary of Transportation and the superintendent of the academy. However, Board Members, in cooperation with the Superintendent, may make other visits to the academy in connection with the duties of the board. While visiting the academy under this subsection, members of the board shall have reasonable access to the grounds, facilities, midshipmen, faculty, staff, and other personnel of the academy for the purpose of carrying out the duties of the board. The board shall inquire into the state of morale and discipline, the curriculum, instruction, physical equipment, fiscal affairs, and academic methods of the academy, and other matters relating to the academy that the board decides to consider. Not later than 60 days after each annual visit to the academy, the board shall submit to the President of the United States, a written report of its actions, views, and recommendations pertaining to the academy. If the members of the board make other visits to the academy, the board may prepare a report on such visit; and if approved by a majority of the members of the board, submit such report to the President not later than 60 days after the date of the approval. Any report submitted to the President will be concurrently submitted to the Secretary of Transportation, the Committee on Commerce, Science, and Transportation of the Senate, and the Committee on Armed Services of the House of Representatives. Lane Kirkland (1942) US labor union leader who served as President of the AFL-CIO for over 16 years. Robert H. Scarborough (1944) First graduate to become a Vice Admiral in the United States Coast Guard; Vice Commandant of the United States Coast Guard; inducted into USMMA Hall of Distinguished Graduates in 1997. Dean White (1945) Chairman and CEO of Whiteco Industries, Inc, Hotel/Display Sign Magnate, Member of Fortune 500; philanthropist; the Dean and Barbara White Admissions Center at USMMA is named in his honor; inducted into USMMA Hall of Distinguished Graduates in 2006. John Diebold (1946) Author of the book Automation (1954); established DiBold Group in 1961 designed and installed the first electronic banking network. Inducted into USMMA Hall of Distinguished Graduates in 2003. Albert J. Herberger (1955) First graduate to become a Vice Admiral in the United States Navy; Administrator, U.S. Maritime Administration under President Bill Clinton; inducted into USMMA Hall of Distinguished Graduates in 2000. Joe Rizzo (1973) "Orange Crush" Denver Broncos linebacker; starting Broncos linebacker in Super Bowl XII. Sean Marshall (1987) Former child actor, star of Disney's Pete's Dragon. ^ While "cadet" and "midshipman" are frequently used interchangeably to refer to students at USMMA, to do so is incorrect. The terms serve two different purposes—the term "Midshipman" refers to a military rank, whereas the term "Cadet" refers to a job description, much the same way the term "Captain" is used for any officer in command of a ship regardless of actual rank. Examples: Midshipman Smith is the Deck Cadet on the SS Kauai, Midshipman Jones is the Engine Cadet. ^ "A Brief History". Archived from the original on 1 December 2010. Retrieved 17 August 2015. ^ "NASA, Maritime Administration Announce new home for Liberty Star". ^ a b "USMMA Rechristens Training Vessel Kings Pointer". ^ "Maybe We Should Reinvent Our Merchant Marine Fleet". ^ "Rescue at Water's Edge: The U.S. Merchant Marine Response to 9/11". Retrieved 15 September 2012. ^ Eberhart, Dave (June 19, 2006). "Bush Address at Merchant Marine Academy Historic". NewsMax.com. Archived from the original on 6 June 2012. Retrieved 15 September 2012. ^ "President Delivers Commencement Address at the United States Merchant Marine Academy". 2006-06-19. Retrieved 2006-07-08. ^ a b "New Hope for Turnaround at Troubled Service Academy". New York Times. 30 Aug 2012. Retrieved 13 Sep 2012. ^ "Department of Public Safety". USMMA. Retrieved 3 July 2013. ^ "10 U.S. Code § 651 - Members: required service". LII / Legal Information Institute. Retrieved 2017-02-04. Upon taking the Oath of Office in the Navy Reserve, a Midshipman is sworn into the armed forces on that date, and serves pursuant to US law and DoD regulations pertaining to midshipmen, including status in the Individual Ready Reserve and potentially subject to the Uniformed Code of Military Justice or mobilization to active duty in the event of a national emergency or war. ^ "US MERCHANT MARINE ACADEMY (USMMA) AT KINGS POINT, NEW YORK". EduMaritime.com. Retrieved 17 August 2015. ^ "USMMA Athletics Accepts Invitation To Join The Skyline Conference Beginning In 2016-17". usmmasports.com. 22 May 2015. Retrieved 27 March 2018. ^ a b c d e f g h "Merchant Marine Distinguished Service Medal Awarded to U.S. Merchant Marine Cadets". Retrieved 17 August 2015. ^ American Merchant Marine Museum Archived 2010-12-26 at the Wayback Machine webpage. United States Merchant Marine Academy website. Retrieved 2010-07-30. ^ National Maritime Hall of Fame Archived 2010-09-15 at the Wayback Machine webpage. United States Merchant Marine Academy website. Retrieved 2010-07-30. ^ "Judge Gray H. Miller's Biography - Southern District of Texas". www.txs.uscourts.gov.